Albin and Georges (Zachary Allen Farmer and Robert Doyle) have an old love and an ungrateful son. Written by Harvey Fierstein and Jerry Herman. Directed by Scott Miller and Mike Dowdy-Windsor. 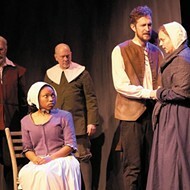 Presented by New Line Theatre through March 23 at the Marcelle Theatre (3310 Samuel Shepard Drive; www.newlinetheatre.com). Tickets are $20 to $30. Wedding bells are ringing in St. Tropez, and no one's happy. Georges, the father of the groom, is concerned that his only child is jumping into marriage too quickly. His son Jean-Michel is only twenty, after all. Albin, the groom's mother, is flat-out shocked by his darling boy's commitment to heterosexuality. "You're a boy; she's a girl. What will you talk about?" he demands. Ah, love. It's long been the go-to subject for both popular music and the Broadway musical, but the love that fuels Harvey Fierstein and Jerry Herman's La Cage aux Folles is of a more unusual variety. It is the love that dare not speak its name — monogamous, committed homosexual love between two middle-aged men. New Line Theatre's production of La Cage draws its power from the strength of that relationship. 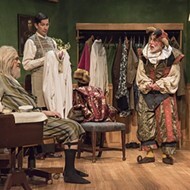 Georges (Robert Doyle) and Albin (Zachary Allen Farmer) argue, irk one another and have their secrets, but there's no question they're devoted to their union. Even as Jean-Michel's nuptials seriously strain that bond, as parents they pull together and as lovers they learn how hot the flames of passion still are. 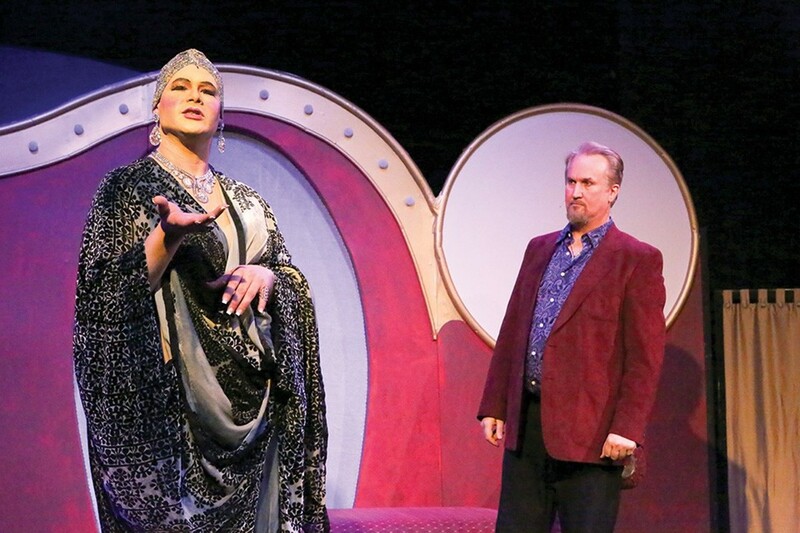 La Cage aux Folles can be presented as simply a frothy, weightless farce, but here, directors Scott Miller and Mike Dowdy-Windsor opt to show how love deepens over time, which gives their La Cage both weight and depth. That depth burnishes the laughs and sweetens the froth immeasurably. It doesn't hurt matters that there's also a lot of froth. Georges is the impresario of the play's namesake nightclub, which specializes in drag entertainment. 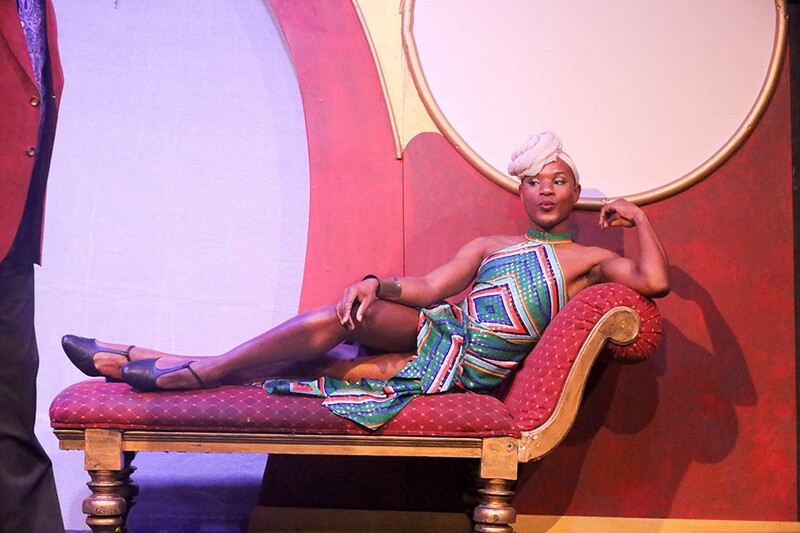 Albin's alter ego, Zaza, has long been the headlining star of the show, which includes the Cagelles, a song-and-dance team of drag performers of varying ability. The family business is now a problem for Jean-Michel (Kevin Corpuz), who intends to wed Anne (Zora Vredeveld). Anne's father is head of the "Tradition, Family and Morality Party," and has pledged to rid St. Tropez of clubs like the one owned by Georges. Jean-Michel's solution is to demand that Georges play straight when the parents meet, and that Albin make himself scarce. Jean-Michel then puts the burden of telling Albin on Georges. Corpuz brings a genuine petulance to Jean-Michel, who thinks he's not asking that much of the men who raised him. 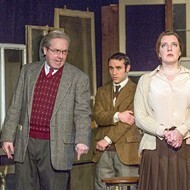 Robert Doyle's Georges is slightly subdued in the early going, but comes to life when dealing with Albin. His performance of "Song on the Sand," which is about the early days of Georges and Albin's story, reveals it to be a profoundly underrated love song. Doyle's rendition of "Look Over There," meanwhile, is the turning point of the show, and he makes it count. Upbraiding his son for his selfishness, Robert reminds Jean-Michel that Albin might not have been the typical mother, but he did no less than one. Jacob (Tielere Cheatem) is the best-dressed maid in St. Tropez, or anywhere really. Tiélere Cheatem is a particular delight as Albin's maid, Jacob. 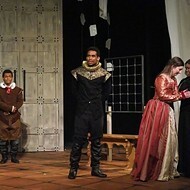 Cheatem wheels from one side of the stage to the other firing off insults, demanding a role in Georges' next production while changing into increasingly flamboyant costumes. Costumer Sarah Porter has outdone herself with Jacob's wardrobe; it's a visual candy sampler that Cheatem wears with panache. I've seen Zachary Allen Farmer in numerous musicals; he always finds something interesting in his characters and astounds with the sheer power of his singing. His Albin/Zaza sets a new standard. His Zaza is suitably mean-spirited and catty, but it's his Albin that's astounding. After being told mid-show there's no place for him in his son's wedding, Albin mechanically returns to the stage for the finale of the show-within-the-show. "Please, get off," he asks the Cagelles, and the way they scatter reveals how unnatural (and terrifying) that polite request is. Farmer harnesses that magnificent voice as he lurches into "I Am What I Am," his defiant statement of pride in himself and the way he lives his life, and as his voice breaks and occasionally dips down to its natural register, you realize how profoundly Albin has been hurt. It is an incandescent performance that blurs the line between singing and acting — the greatest moment Farmer has wrought on stage to date. Remarkably, the show continues after that point. There are deceptions, wacky plans and even more outlandish costumes from Jacob, as well as the redemption of Jean-Michel and a restored relationship with Albin. It remains a very entertaining show, even after 36 years. Jean-Michel and Anne will have their wedding, but no one would consider them blessed unless they follow Georges and Albin's lead. It's no mistake that the strongest family in the show remains the aging gay couple who get their groove back, even as the man who stands for "family, morality and tradition" gets his comeuppance.